When do you run lessons and for how long? 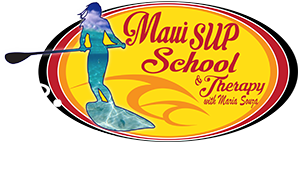 Beginner’s lessons starts with a 1/2hr land lesson 7:30 or 8:00am, Maui is a windy place, the earlier the mellower the wind, SUP Surfing Lesson starts at 7:30 or 8:00am at location to be decided accordingly to swell. Downwind lessons starts around 10:30 to 2:00 noon. Private Lesson last about 1.5 hours, all others 2 hours, all beginners lesson starts with a .5 hour land lesson, that’ll speed up your ocean performance and guarantee your success, day tow and therefore we go straight to the ocean. Will I be able to do it first time? Yes! Although stand-up paddle boarding is not as easy as it’s usually promoted, our stand-up ratio is 100% on first session, plus you’ll take all the tips on posture, body awareness, injury prevention and self therapy for in or out of the water. I have no water sports experience at all, will this make a difference? No, previous water sports experience is an advantage, and sometimes better to have no experience than bad experience/habits. To cut the learning curve, to enjoy your time ON the board and not waste all your energy getting back ON the board. To learn how to fall properly if you fall, to learn SUP & Surfing Etiquette, to become aware of your environment, and to become safely independent. We use Jimmy Lewis high end of the industry boards and paddles, we also sell them on our website with a discount of lesson and board/paddle package, all you need is a bathing suit, rash guard and hap, optional, and don’t forget a towel. Where is the teaching location? Beginner’s lessons start with land lesson on location on North Kihei. SUP Surfing and Downwind location varies accordingly with swell size & direction, wind strength and direction. How many people can go in one class? Our favorite is 2 people, when you book 2 or more we’ll close the group, we do group of 4 maximum to operate safely. For bigger groups, Corporate group, Family Reunion, etc., call me. It is an excellent opportunity to learn how to be safe in those conditions, in case you experience that in the future, and you’ll have a well-trained instructor with you. Your safety and enjoyment is our concern so we will reschedule your lesson if conditions are unsafe or unfavorable. Will I be riding waves on my first SUP Lesson? Most likely no, we have so much important topics to share about safety, posture, reading the weather/environment, floatation, you’ll need to get the basic first before we add the moving water under your board, but keep going to the second lesson and yes you’ll ride small waves (weather allowing). In case you already SUP Surf and want to improve your skills, then select a private single lesson or buy a package. What qualifications do the instructors have to teach? Our Reputation precedes us, being the first SUP School ever. What makes our school unique is the overall understand and respect for the ocean, your physical body and emotional awareness you get from our lessons. I also have taught Surfing for beginners and for big waves, Windsurfing, Kite surfing, and since 2005 I have shared my Ocean and SUP knowledge with thousands of happy people like you, please read About Maria Page, for some of my qualifications and former students testimonials. Other than the requirement of living the water life of Maui, I train all the helpers and they speak the universal language of Aloha! When should I think about getting SUP coaching? When you become serious about SUP, SUP Surfing, SUP Racing, SUP Channel Crossing, or just become addicted on how effortless and complete workout at the same time SUPing is, plus you get the easier moving meditation effect as bonus. How heavy is the board, will I be able to carry it? Your equipment should become one unit with your body, it’s not heavy at all when you use your proper posture and squat instead of bend from the back, you’ll practice at the land lesson. Is there going to be Sharks? Yes the Ocean is their house, and No, probably you won’t see any, the best part is that you’ll most of the time on top of the water, where the view is amazing! Ps: The best SUPier in the water is the one having the most fun! We at MSOSE, LLC. Believe that: PAIN IS NO GAIN!!!!! !